Lake Malawi is very safe for swimming. Swimming in the Shire River is suicide. (don’t swim in one of the other lakes – Chilwa Malombe etc.). You know the song about ‘messing about on the river’? That song is not applicable to the Shire River. When in Malawi if someone tells you that something is ‘very dangerous’ it could mean that that some thing is close to suicide. It does not mean that the person telling you this is some jobs-worth from the local council trying to justify his job with unrealistic claims and wild exaggerations. Strangely, and amazingly enough, when someone tells you that something is ‘safe’ then it probably means that it is…wait for it….safe. Wow! What a surprise! Hotel and lodge owners by Lake Malawi will tell a visitor who asks that it is safe to swim. (Normally people don’t ask – most people know it is safe). Don’t be suspicious of their vested interests. Just be aware of a few small ‘rules’ which are 1/ don’t swim between sunset and sunrise, 2/ don’t swim in the mouth of a river, 3/ don’t swim among reeds, 4/ do swim in an area recognised as being for human swimmers, tourists, villagers etc. and 5/ if swimming in a new area you find don’t do so without asking the locals first about whether there are crocodiles. 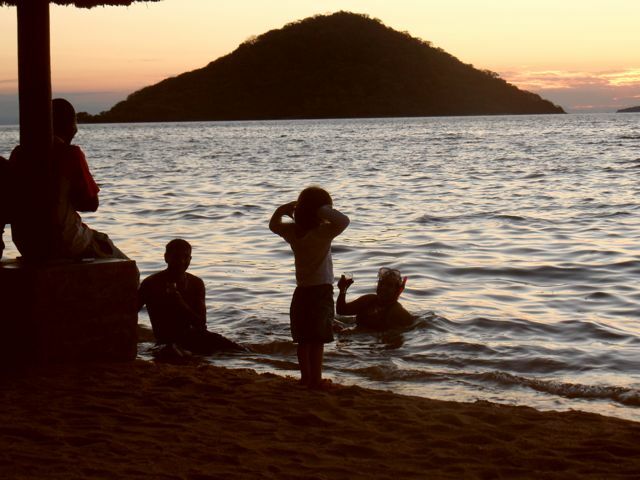 Lake Malawi is very safe – it is unlikely that you would need to know more than that. The biggest danger at Lake Malawi are mosquitoes. Take sensible precautions. Beware of the danger of NOT swimming in the Lake. The regret associated afterwards with having missed out on The Lake may be bad for your health. There is a pub argument over whether hippos or crocs are more dangerous. It is interesting to discuss the subject but it may come down to location and whether one means ‘killed directly’ or ‘killed indirectly’. I was reading the online comments of an angler brought up in Malawi who from his boat has witnessed people being taken by crocodiles in the Shire River – it is more common than most people think. The angler said that hippos can count as more dangerous if you mean that by capsizing a boat full of people who cannot swim the hippo has killed them (including the ones subsequently eaten by crocodiles). 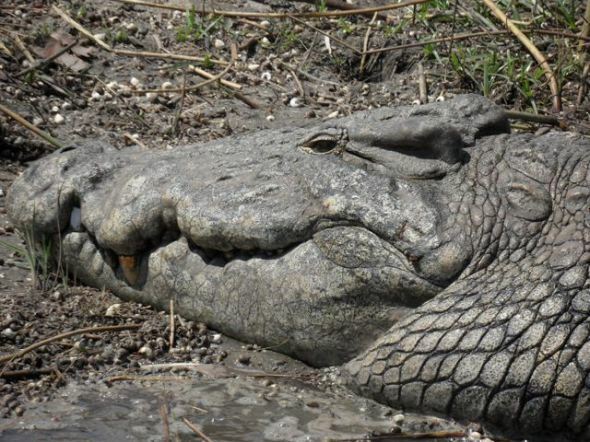 Two years ago a Game Warden in Liwonde National Park said that 34 people had been killed by crocodiles so far that year in the Shire River in Liwonde National Park. Others I’ve spoken to locally back this up. This year I was told 10 or 15 so far this year in that particular stretch. They are local fishermen on dug out canoes fishing illegally at night. Wardens tell of meeting survivors they have saved (after all the other colleagues on the dug out canoes were killed) a couple of weeks later back on the canoe. An article I read by a licensed crocodile hunter said that at the worst time of year for it about two people a day are being killed by crocodiles in the Shire. This is an estimate – no one really knows. Someone from America was telling me that when new to Malawi he went fishing in the Shire with his family. They waded in, with waders I think, as if they were fishing in the Tweed or the Tay… To be fair to them he did say that the current was moving so fast as they were next to a waterfall that he did not think a crocodile would be there…or could swim through it. The next thing that happened was that a Malawian on the bank said “A crocodile is coming.” and he looked up and saw a mammoth croc coming very rapidly from the other side as if there was no current in the river at all. They all got out just in time. do you get a sense of where I am coming from with regard to the Shire River? What about bilharzia in Lake Malawi? There is a tablet you can take if you are worried or concerned. Do not worry. I know one guy who works with wildlife in Malawi who tells me that when he goes to The Lake he spends all day in the water. He said he gets his food order from the hotel or guest house brought to him in the water. Bilharzia is dangerous if you live by the Lake and have no access to modern medicine. I really do not worry about bilharzia…at all. As I say, if you are concerned then get a check up a few months after swimming or take a tablet (pill). I did once hear about someone who had a complication connected with bilharzia. It was something unusual and connected with something else. Still, I think the biggest bilharzia risk for a western visitor is that it puts you off going into the Lake. Actually, there is another bilharzia risk if you are returning to the west. I made the mistake of mentioning, when in hospital, that I should get a bilharzia check. The medics were fascinated. They wanted to detain me. I realised that it was out of curiosity and because they wanted me as a specimen for their medical students. I got fed up with the time wasting to my day and discharged myself. I really could not be bothered. Maybe one day I’ll bother to get a check or take a tablet. Now, I wanted to edit this post as the paragraph above does reflect something of the attitude of someone brought up here for who ‘bilharzia’ is a familiar word. There is an extent to which familiarity can breed contempt – including perhaps a feeling that the disease is nothing much to worry about if you have access to modern medicine (which is more of an issue for local villagers). Coming into Africa for the first time an exotic sounding tropical disease could sound slightly more intimidating. It is partly the fear of the unknown. That is understandable. My advice is to take the required medication or get a check a few months after swimming and apart from that think nothing else of it.